She might be WBEZ&apos;s most loved on-air presence, even (or especially) when traffic is bad: "It&apos;s Friday the 13th and an unlucky day for listeners of WBEZ," said Tony Sarabia Friday morning on Eight Forty-Eight. Tony had the heavy task of saying goodbye to traffic reporter Sarah Jindra, who is leaving WBEZ for a position at CLTV/WGN. "It&apos;s weird to be on after 9 o&apos;clock," joked Jindra. "Well, you make 5:30 [a.m.] a great place to be," said an emotional morning host Lisa Labuz. Jindra gets more questions at our listener events than anyone else. "It&apos;s like we&apos;re at a press conference and you&apos;re the mayor," said Sarabia. Jindra actually started out as a television reporter in Urbana-Champaign, so her move to TV is not without precedent. And she hasn&apos;t always been traffic-obsessed; at the beginning of her career, "I just really didn&apos;t even know this was a real job," she told Sarabia. 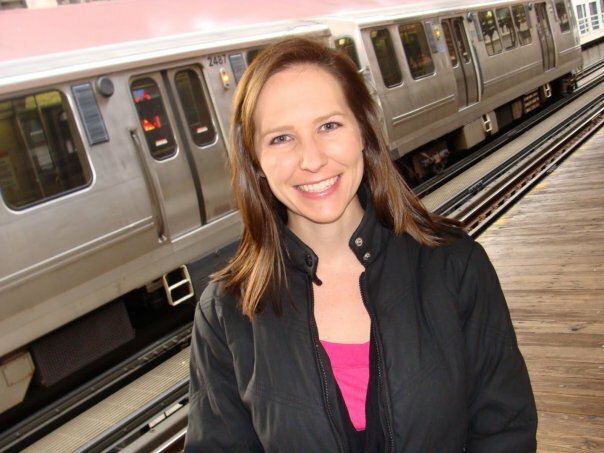 Jill Egan will continue doing afternoon traffic reports, and while it has not yet been announced who will replace Jindra in the mornings, she has advice for her successor: "Do a lot of CTA; public transportation is really important to our listeners," she said. "And Lakeshore Drive, Hollywood to Balbo — they love that travel time." Listeners, fear not: Whoever is next, we know you&apos;ll love him or her just as much. For the hosts, it might be a little harder: "Just when I get used to not calling you Abby Ryan, you up and leave," joked Sarabia. Well, "They can critique me on my TV skills now," quipped Jindra. "I am so incredibly grateful for all of your support over the last several years! You are such an engaged audience and it has been a joy helping you get to work on time (or at least helping you know how late you&apos;ll be!). I can&apos;t thank you enough for all of your emails, tweets, FB posts and calls. I&apos;ve really enjoyed getting to meet so many of you at station and community events, and getting your feedback on how to improve my reports over the years. "